XEffects Snapshots is a media rich template plugin with a unique onscreen 3D animation control system. Snapshot automatically freezes video, inserts it into a frame and positions it onto a background in 3D space. All with just a couple of clicks. Snapshots comes supplied with over a 100 sample templates that you can drag & drop onto your footage. Use these out of the box, adjust to suit, or build your own from a choice of over 60 hand designed frames or 38 backgrounds. That’s over 2,200 different combinations! 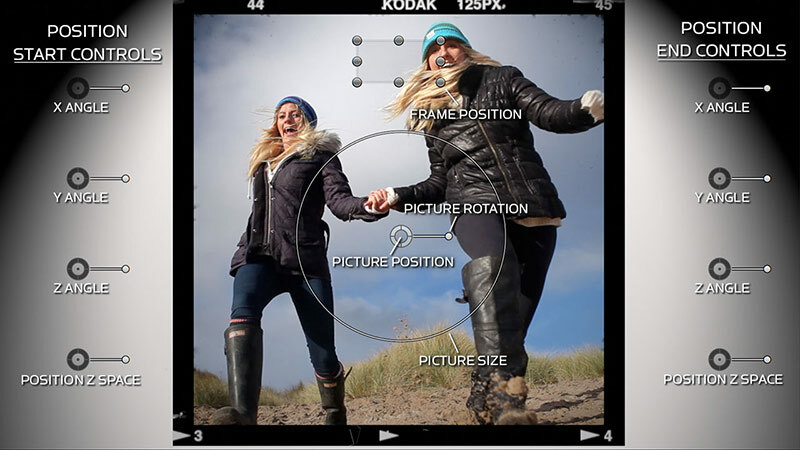 Select the Dropzone option to use your own backgrounds. 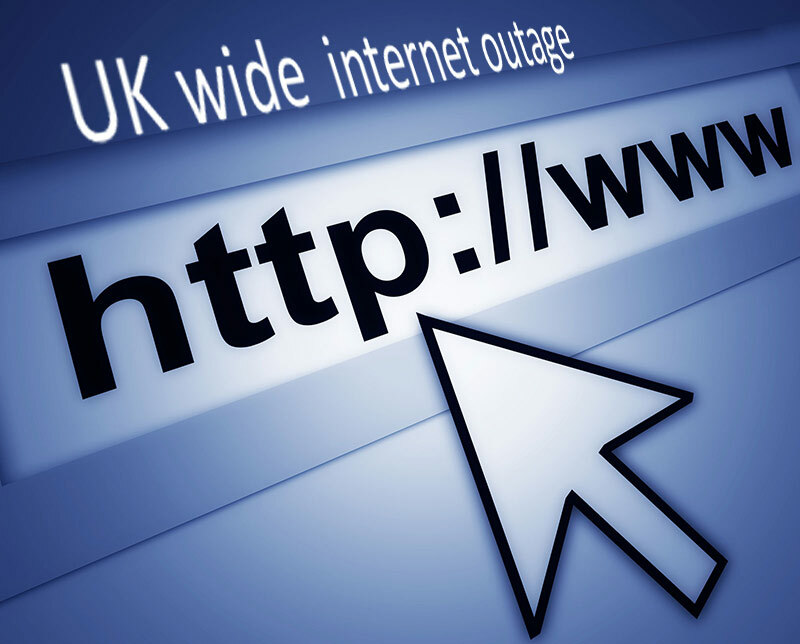 Major UK outage issues from London, Birmingham, Manchester, Glasgow to mention but a few, internet users are having various problems from slow to dead stop internet connections. 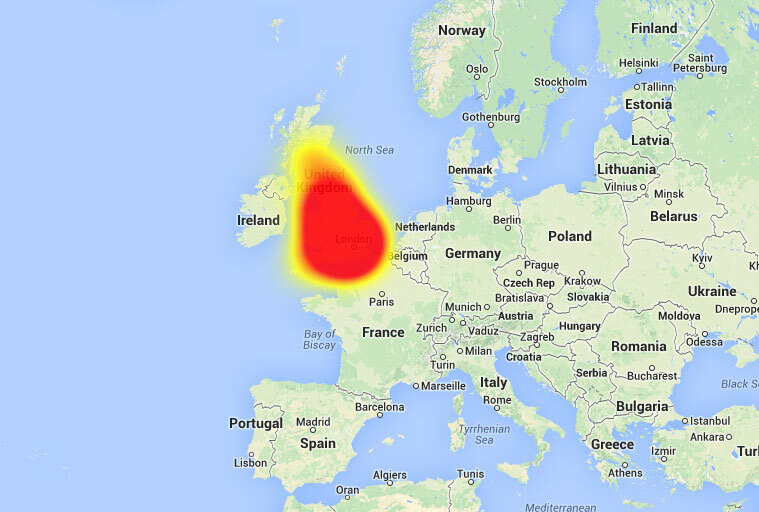 This was the internet map outage this morning, totally unprecedented in the UK a complete internet outage. 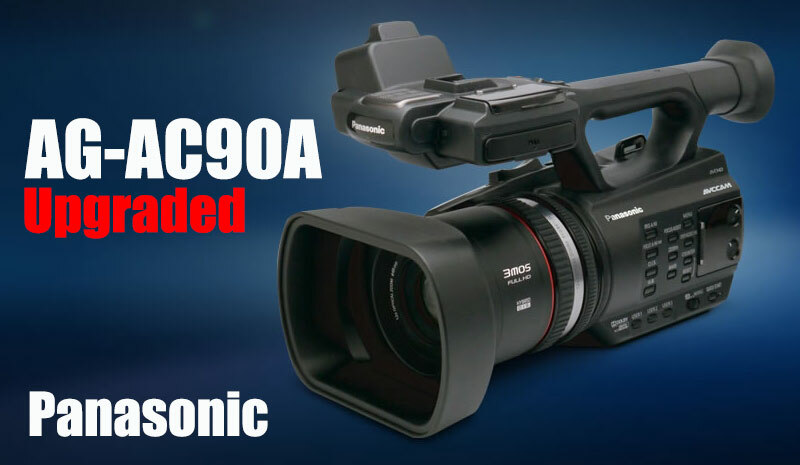 Panasonic is hereby announcing the upgrade of the successful AG-AC90 AVCCAM camcorder, the AG-AC90A. The new AG-AC90A inherits the high image quality from the original camera, but features enhanced network capability and a range of useful professional functions. 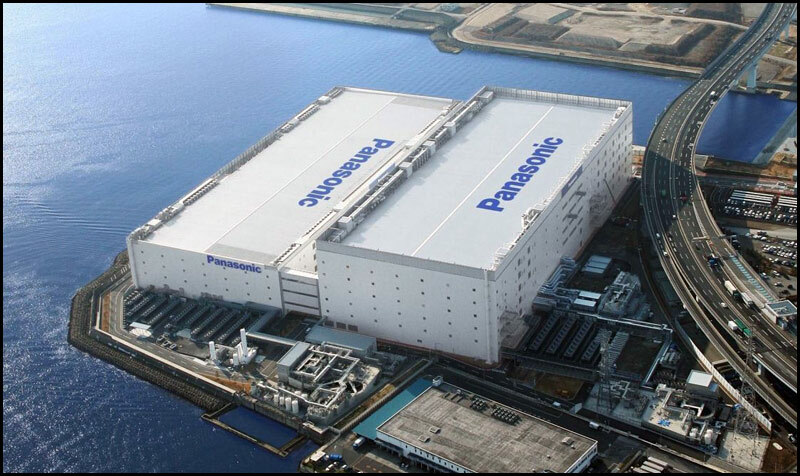 Panasonic’s new AG-AC90A AVCCAM combines the high image quality, advanced functions and easy operation that professionals demand in a stylish, easy-to-handle design. 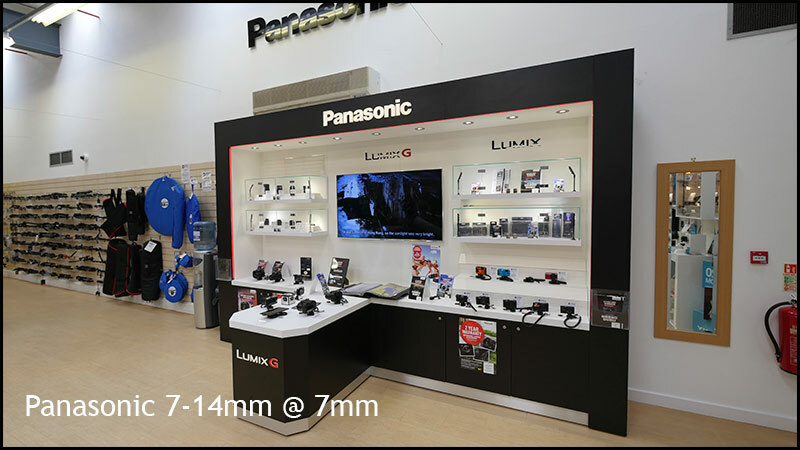 The 12x optical zoom lens starts from a wide angle 29.8mm (35mm equivalent) to 383.7mm. The camera features a high speed F1.5, BI (back-illuminated sensor) type 3MOS image sensors providing Full-HD resolution. In addition to high-quality professional PS/PH mode (1920 x 1080) recording, the AG-AC90A supports PM mode (1280 x 720) and low-bit-rate CS mode (720 x 576) for delivery over a network. When combined with an Eye-Fi card, it fits right into production workflows that use networks to transfer data files to PCs and upload to cloud servers. 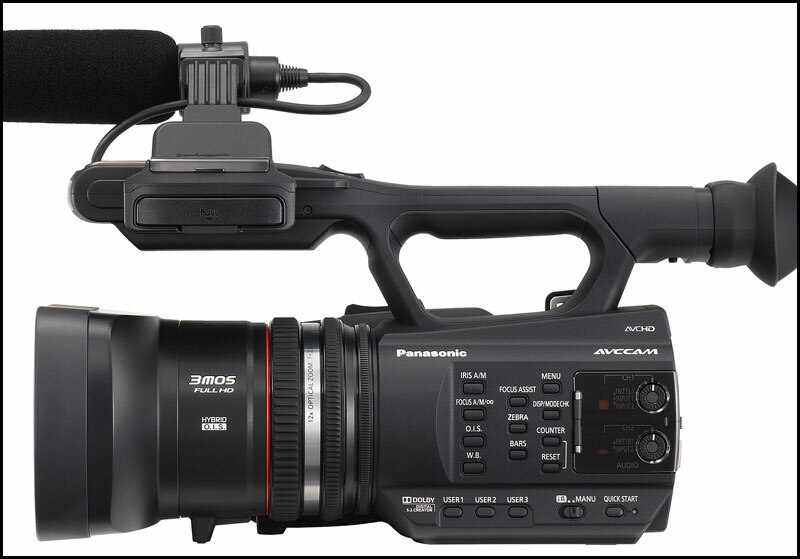 Other professional operating features include Triple Manual Rings (focus, zoom and iris) that approach the versatility and feel of the interchangeable lenses, XLR Microphone/Audio Inputs, and remote terminals to provide the system expandability that professional applications require. 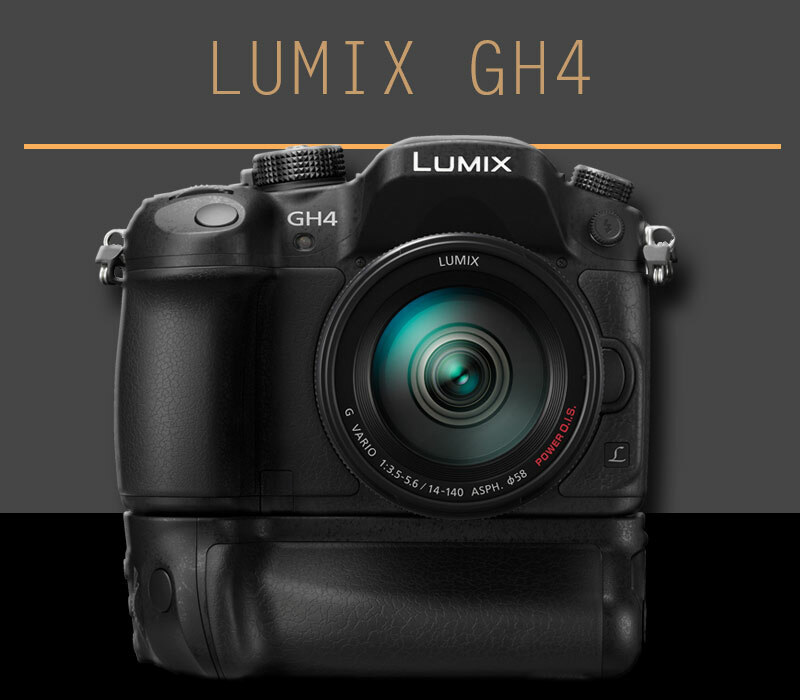 So why is the GH4 almost non existent…simple…It’s the most popular selling 4K DSLR on the planet and Panasonic can’t keep up with demand. 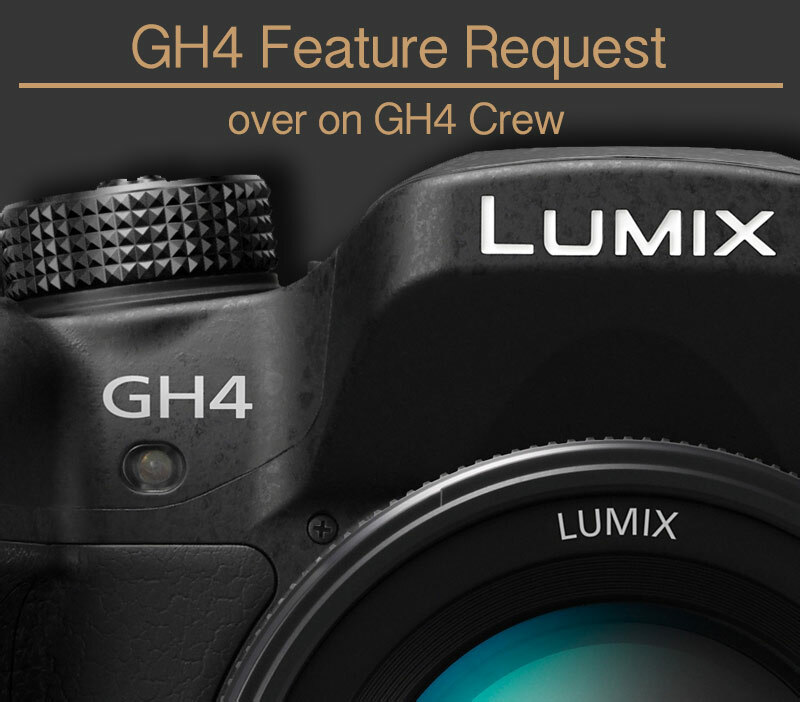 Even running the factory 24/7 can’t keep up with the world wide demand for the GH4, it’s a major success for a camera thats exceeds all expectations. HDW : “I am in the process of producing a major user video review using my own GH4’s and its a cracking all rounder, video wise the cinematic picture is hard to beat and for those of you like me having had the GH3 this camera (GH4) produces better quality video footage than the GH3 at 100 Mbps. 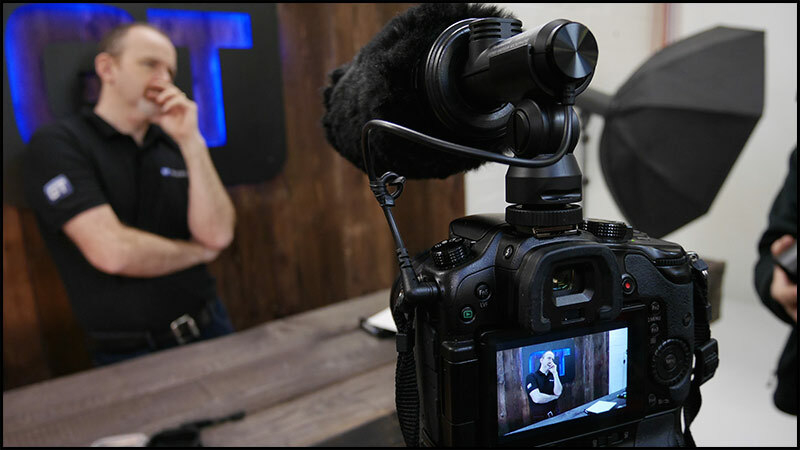 The YAGH (SDI/XLR adapter) takes this camera to an all new professional video level with SDI and full size HDMI video monitoring up to 1080 50p. What you can do with 4K is only limited by your imagination, in my case I am using 4K on an HD timeline giving you multiple framing posabilities so for all those cynics out there you don’t need a 4K monitor or a 4K platform to use 4K professionally in an HD environment”. 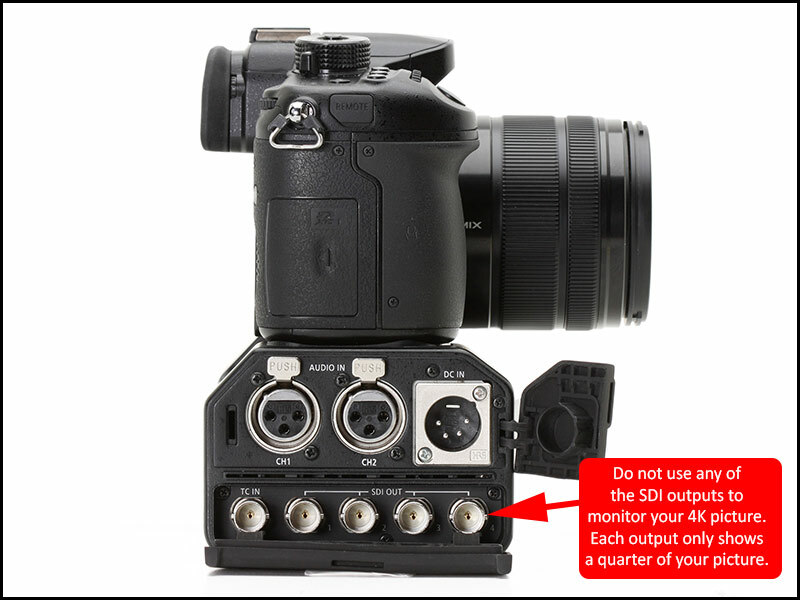 The next two weeks should start to address the backorders for those of you who have ordered your GH4 but having free stock is another matter. 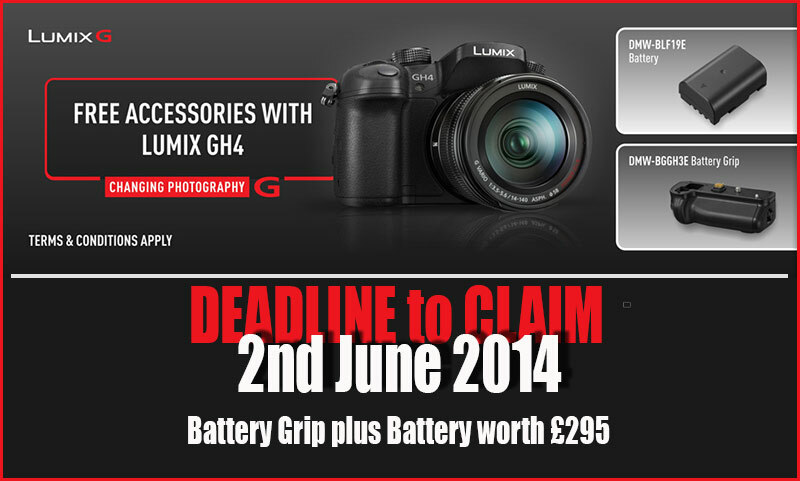 While I am here Panasonic had a deal for early birds buying the GH4 which in my opinion should be extended as they have not fulfilled their initial pre orders ! 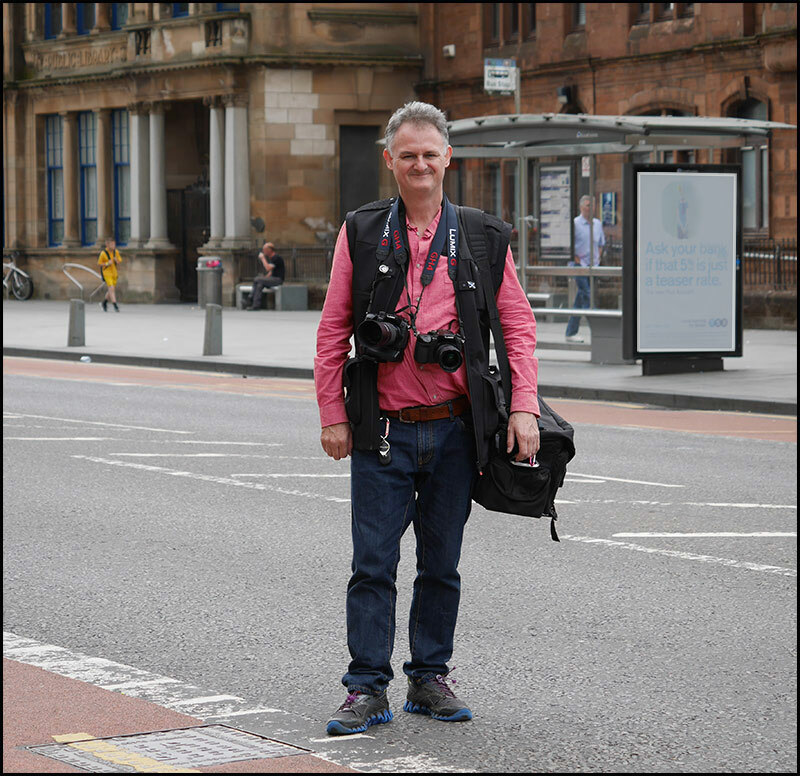 Armed with my 2 Panasonic GH4’s one with a 35-100 f2.8 Lumix G lens and one with a 7-14mm f4 Lumix lens both cameras set to 12 fps. 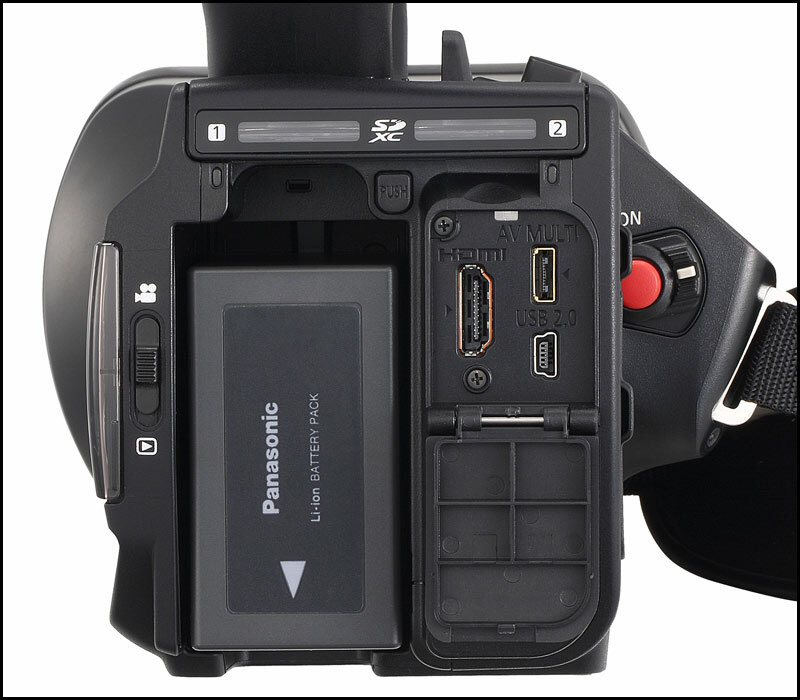 With the Transend (C10 S3) SDXC cards inserted its a breeze to sustain 12 fps over 5-6 second bursts. 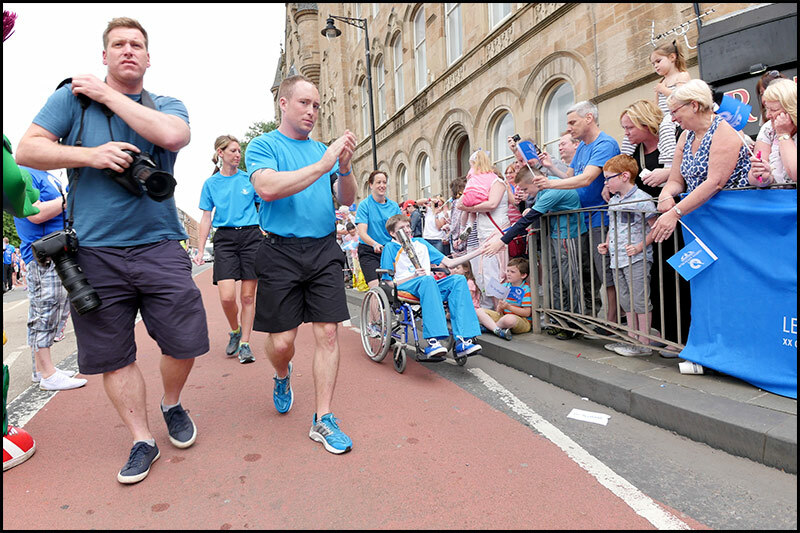 The venue was Rutherglen main street to photograph the Queen’s baton relay for the Glasgow Commonwealth games due to arrive next month. 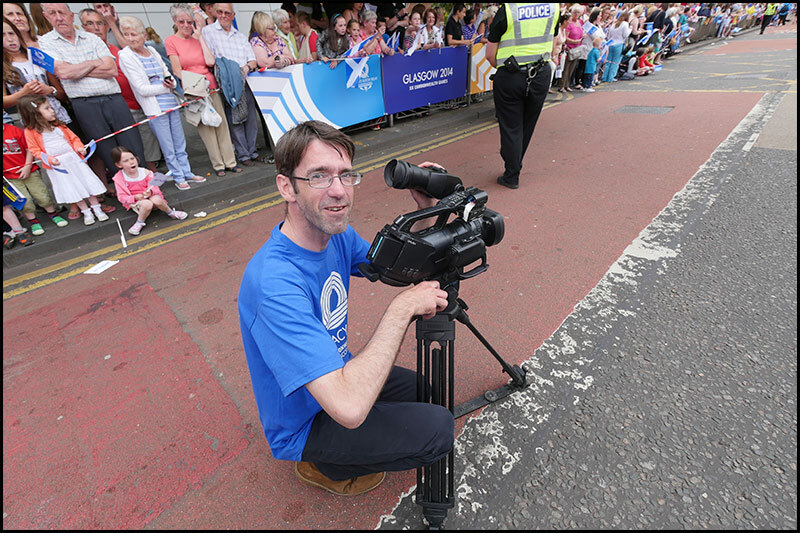 South Lanarkshire Council had their in house cameraman filming the event with a Sony EX-3 though the chap did tell me that his PC did not handle the XDCAM file all that well. 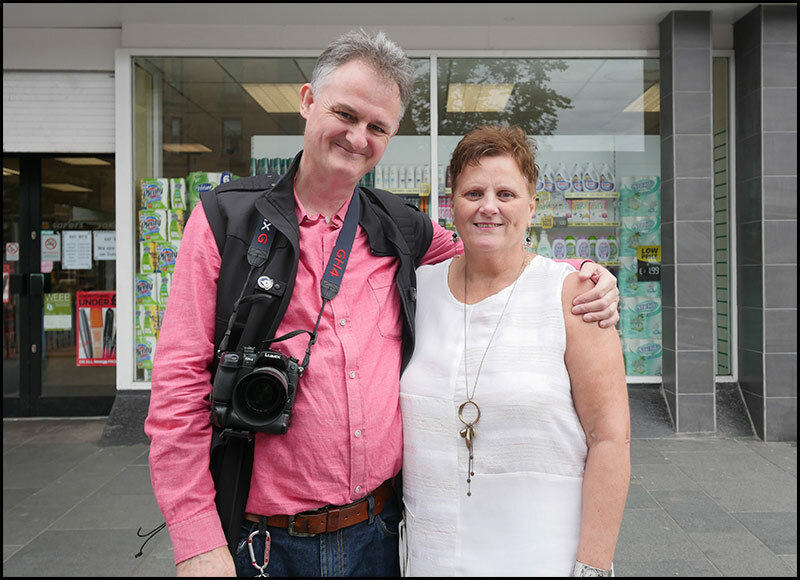 I bumped into a former work colleague Dorothy, we both used to work for Flashback Video back in the 1980s. 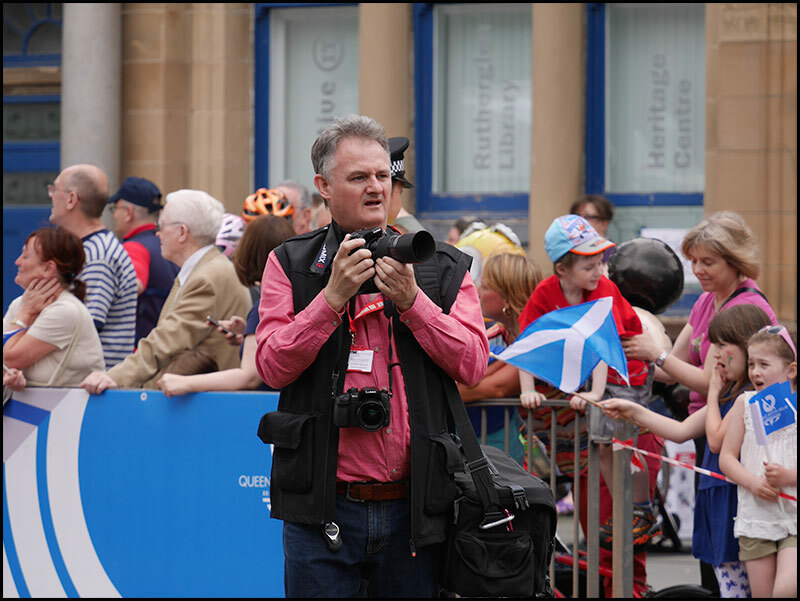 One of the chaps hired in to follow the Scottish section of the relay was on hand with his newly acquired Sony EA50 which he told me he was delighted with its overall performance. 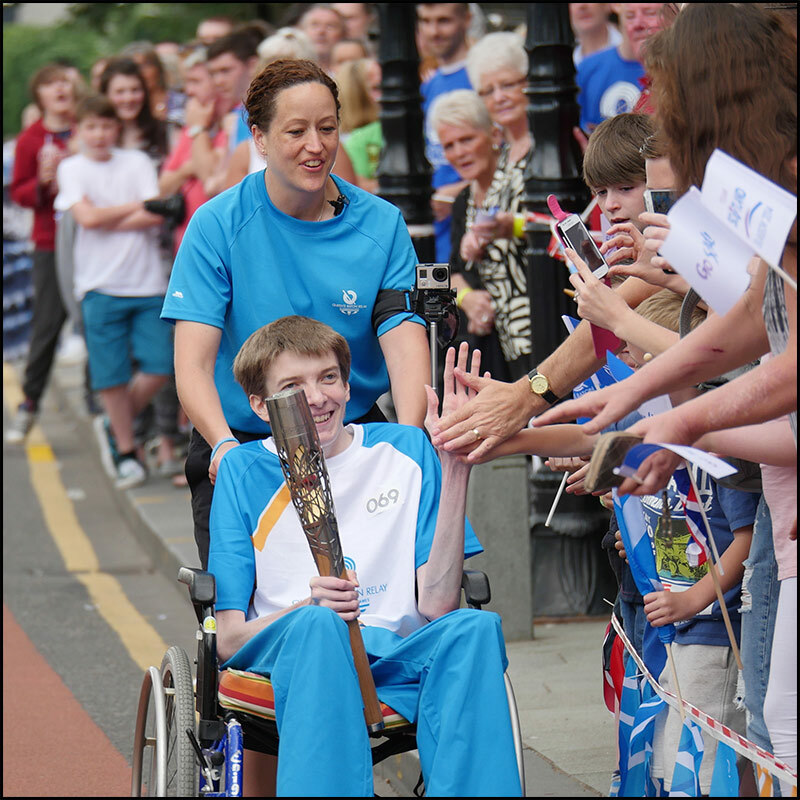 This is the wee hero of the day, young Sam McAleer who went through major heart surgery only a few months ago but is here to not only tell the tale but carry the Queen’s Baton. 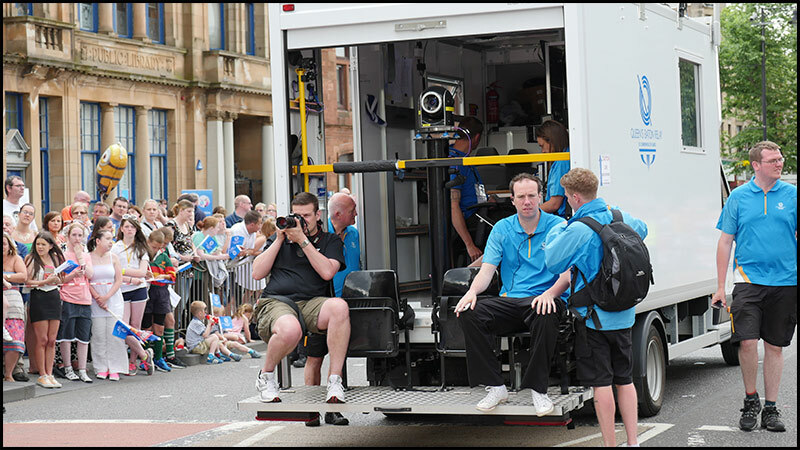 As usual the media truck followed in front this year with a gyro headed camera for better stability. 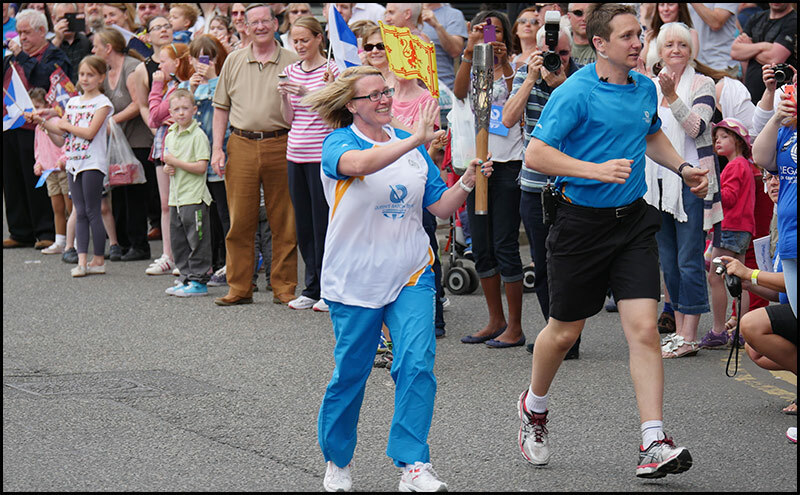 The other part of todays relay carried by a young very exited lady. 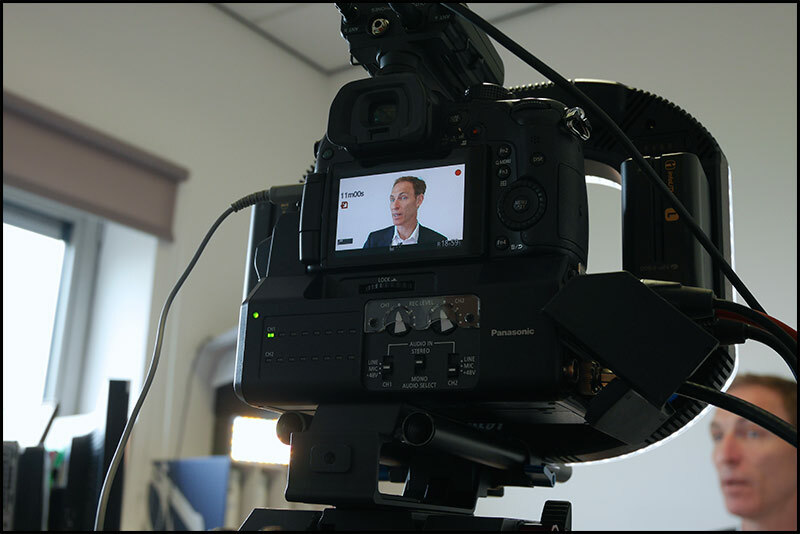 The 2 GH4’s were a dream to use having 12 fps tracking focus gave me a lot of options not open to some of the seasoned pros with their heavy Nikons hanging round their necks. 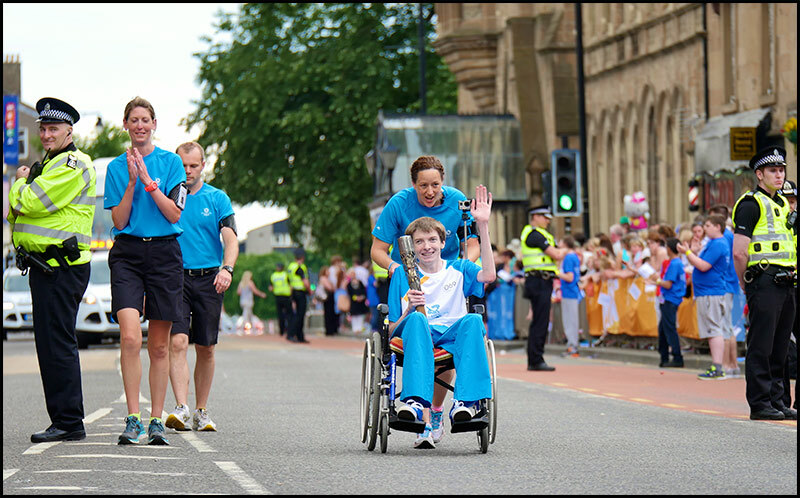 This was my picture of the day wee Sam getting high five’s from the cheering public. I posted my best pictures on Facebook earlier today knowing Sam and his mother Shirley who is one of my friends would see them. It’s such a joy to use a skill like photography to add pleasure to other’s lives. If you double click on the picture above you will get a 2560 x 1440 enlargement. Note the info tab tells you about the original material (4K) not the timeline info. I decided to take the dance footage a further stage forward using the scale mode as a zoom, this allows you to contain the shot at the precise moments…this level of control is not available to you on one off live vision mix, in other words “off the hoof without a rehersal”. Opening up Video Animation allows you to see your transformations… in this case I electronically zoom in to contain the shot and zoom out slightly still containing the shot. I also zoom in on a shot and perform a slow pan left to right. Also note with this type of electronic zooming you don’t suffer any “f” stop closure. 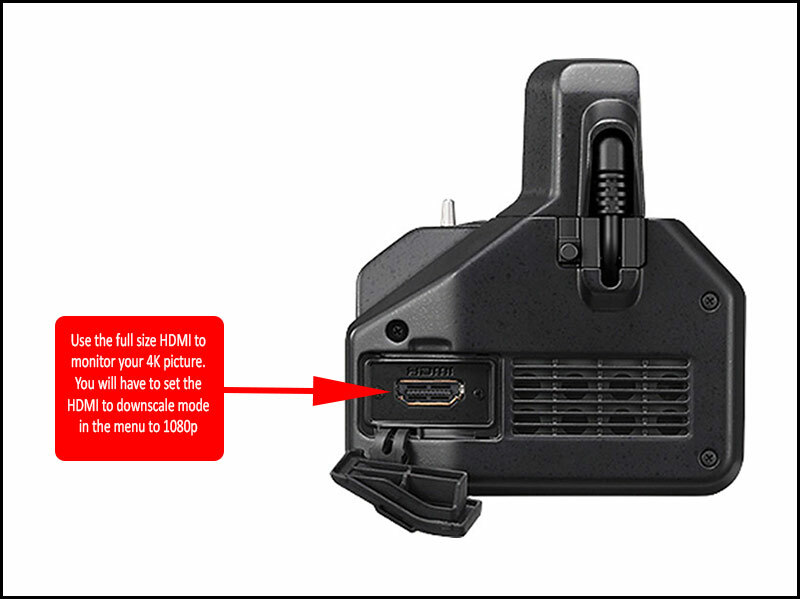 Only when you use the YAGH in a hurry do you discover why you don’t monitor any of the SDI outputs while in 4K…it only shows you a quarter of the picture ! Just to let you see some of the pitfalls I have edited a fresh dance with some jerky camera movement due to me using a photographic tripod and forgetting to lower the middle column which causes shaking when someone walks past the tripod. 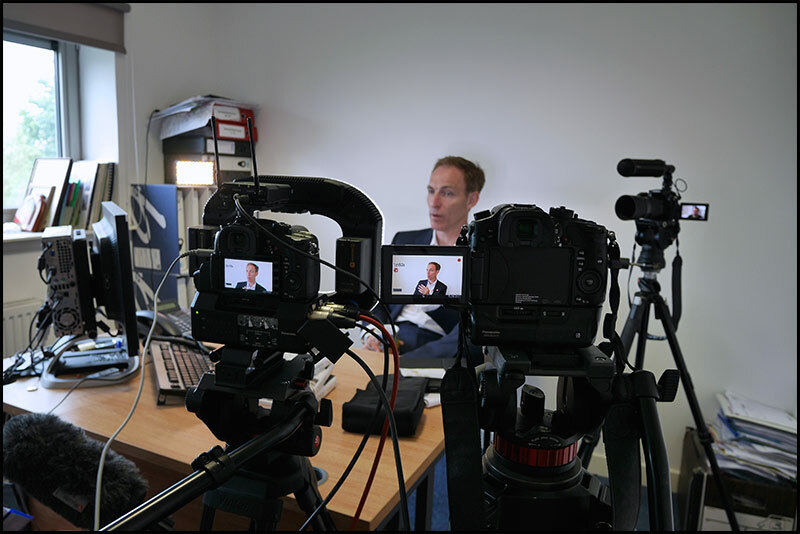 I am experimenting with the Panasonic GH4’s capabilities while producing material for my user review, in this case utilising 4K. 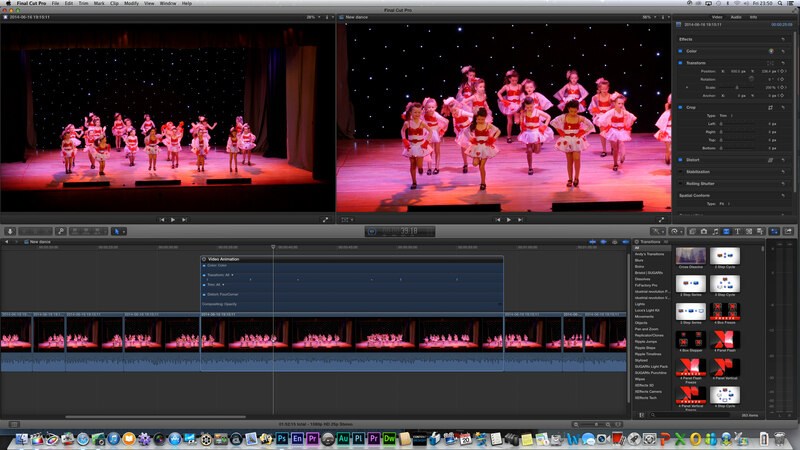 I have always had the idea that 4K material would be great for interviews but never crossed my mind that it would be any use for a live production like a children’s dance show. 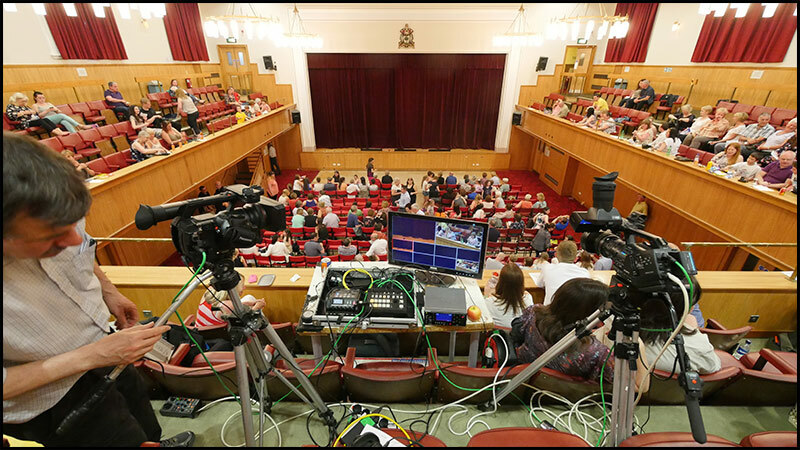 Last evening I turned up to my friend Alister’s dance show recording, as usual he had a full rig, 2 SDI camcorders, talkback, vision mixer, multi screen, XDCAM EX-30 recorder…the lot. I turn up with a GH4, 12-35mm f2.8 Lumix G lens and a tripod. 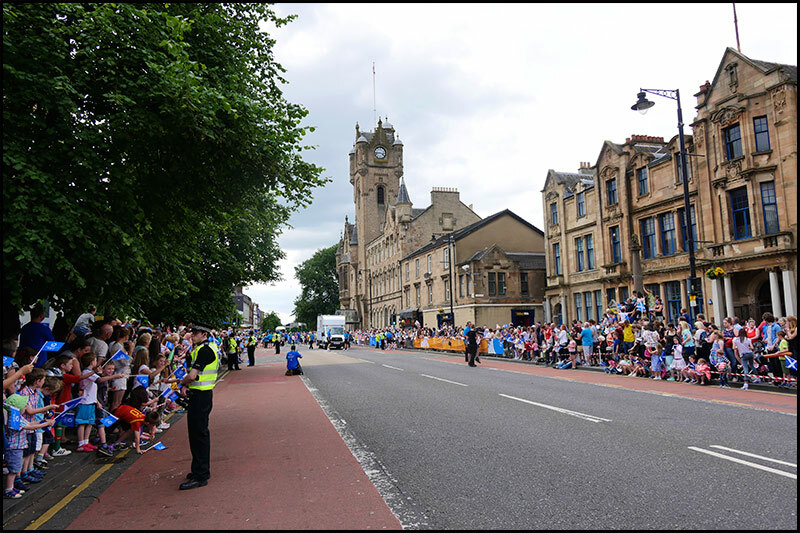 See what you think…I am rather amazed at the results especially the post produced pan shots. Here is the trick, firstly don’t shoot at maximum aperture I was between f3.5-4 and the critical part of this shoot was focus, you can’t afford to be anything other than spot on, I would suggest using an external monitor to make sure you have focus, don’t shoot using anything other than manual focus, 4K is very unforgiving especially in crop mode. 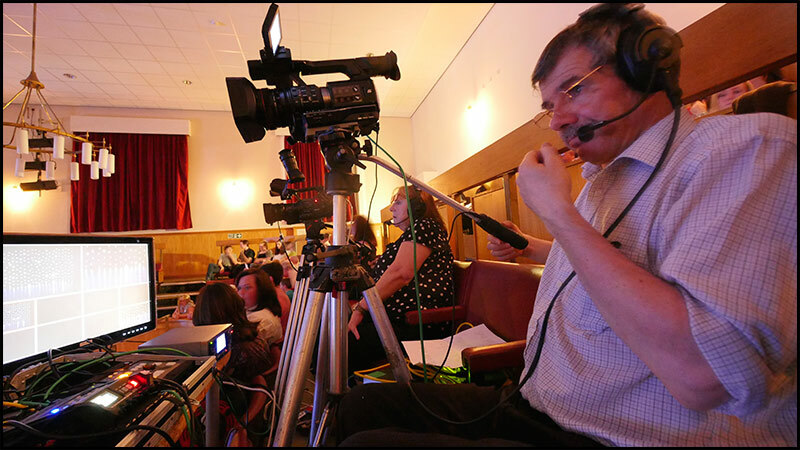 I used a Lumix mic (DMW-MS2) for the experiment but would highly recommend the Tascam DR60 (£200) as you have the option to use 2 phantom powered XLR microphones and record to SD card as a safety backup. Finally the show lasted 2 hours so two 64G cards would give you 2h 40m, the saving in labour both in humphing a lot of gear up one flight of stairs and the wages for a second cameraperson would be enough to persuade me this is the way forward for children’s theatre shows, plus filming it this way takes out any fear of missing something off camera. 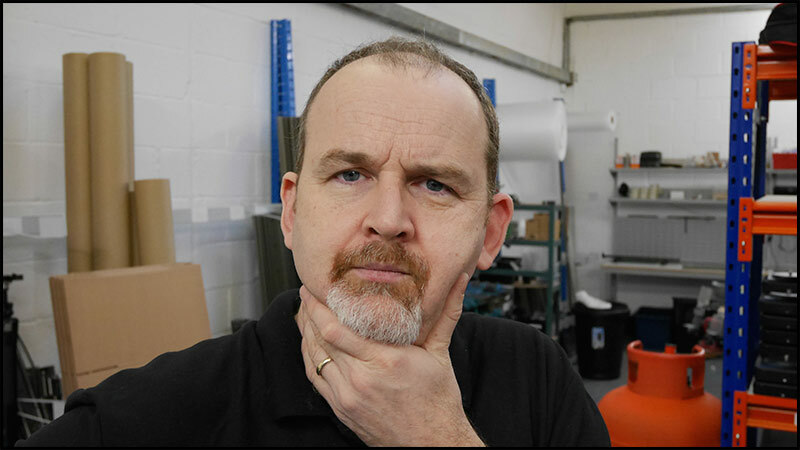 What about the workflow…The 4K file needs rendering on my 1080 25p timeline but I am still using a full spec iMac, having a MacPro would certainly speed the process up considerably. 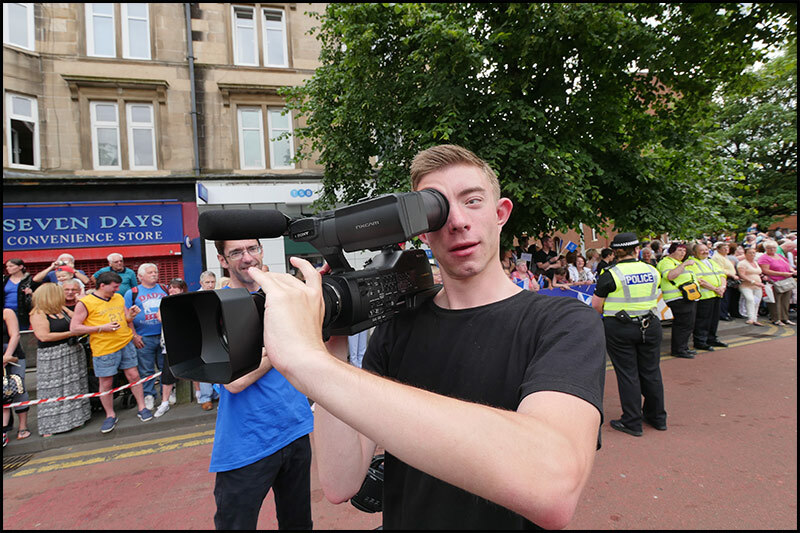 The one minute edit…time wise, compared to having two streams of 1080p footage on top of each other and cutting away the unwanted footage. 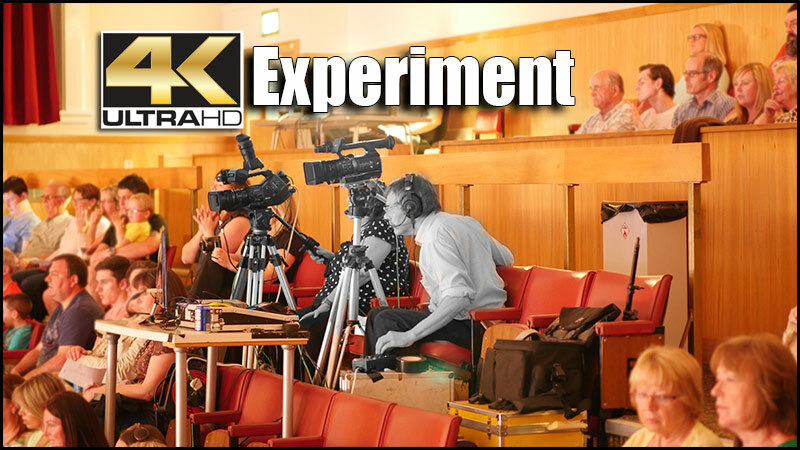 I dont film domestic jobs like dance shows so I can’t take this experiment any further but if you want to save a lot of effort producing a 2 camera event this must be a serious option. 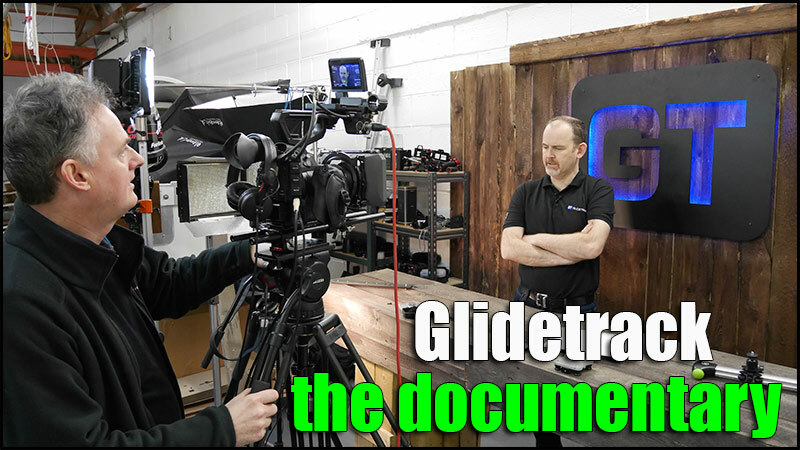 After a few months filming and editing I have finally finished my documentary about Alastair Brown, the owner of Glidetrack. 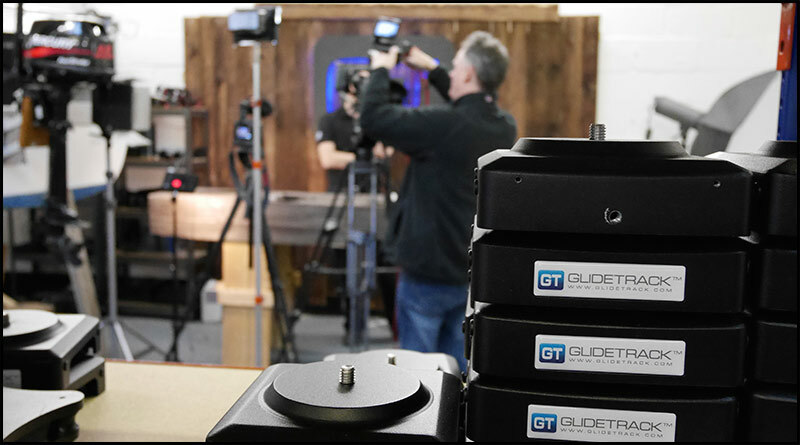 Alastair has spent the last 8 years building up Glidetrack literally from his house to his own premises in Paisley, Glasgow. 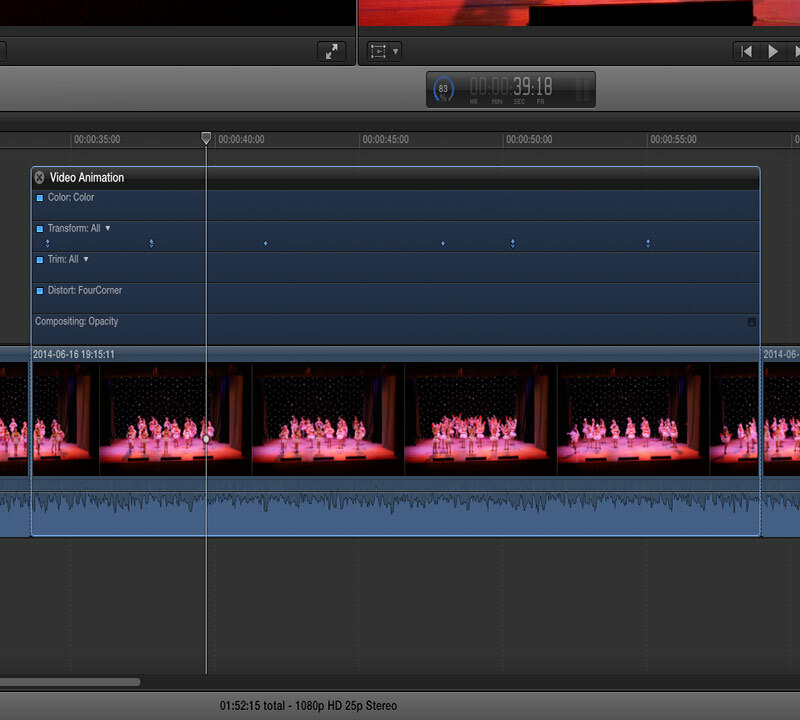 The new carriage that makes the slider what it is…what can I say…fantastic…it can’t get any smoother. This was the shoot that convinced me to sell my Canon C300 as I was getting tired of filming 720 50p when the GH3 beside it could film 1080 50p @ 50 Mbps. 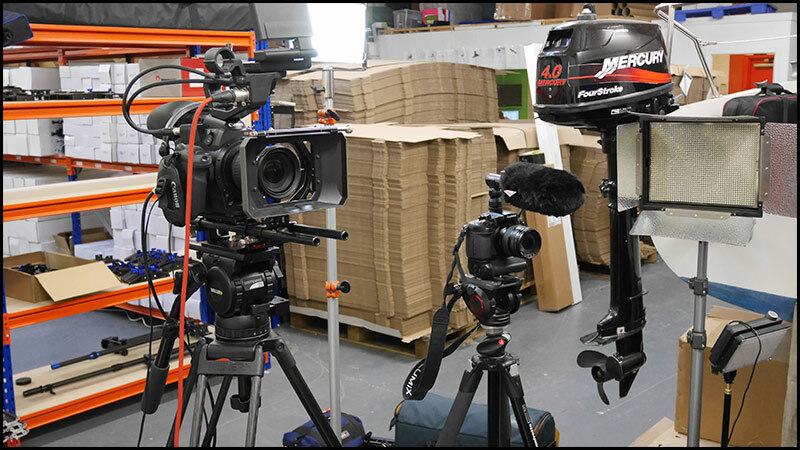 We are now on two GH4’s filming 1080 50p @ 100Mbps what more can I say. 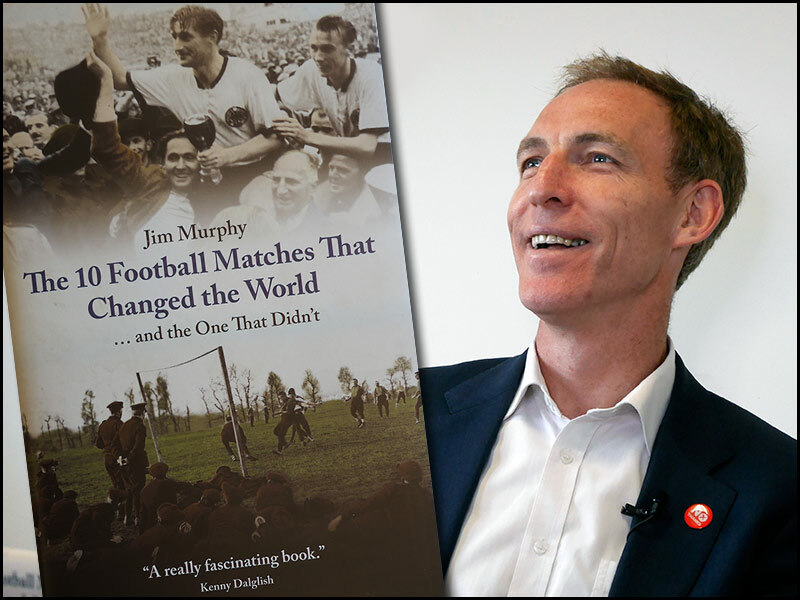 Using 3 Lumix cameras, 2 GH4’s and 1 GH3 we produced a rather tasty 3 camera shoot talking about Jims new book. 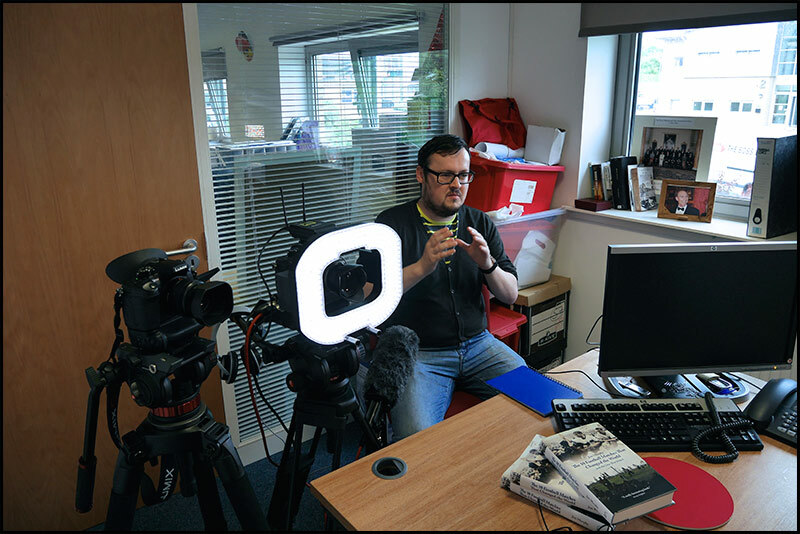 One GH4 had a 12-35mm f2.8 lens set at f4, the YAGH adapter set to stereo with Ch1 on radio mic and Ch2 Sennheiser Gun mic and the Ledgo ring light for light. 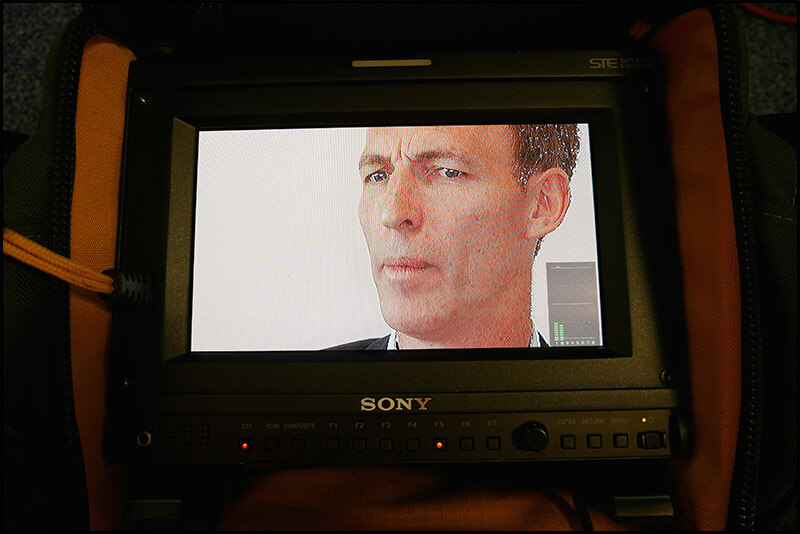 The bonus for me was the adapters SDI output allowing me to not only monitor Jim’s main camera but with a neat trick via button 5 of the Sony PVM-740 you can zoom into the picture checking focus. 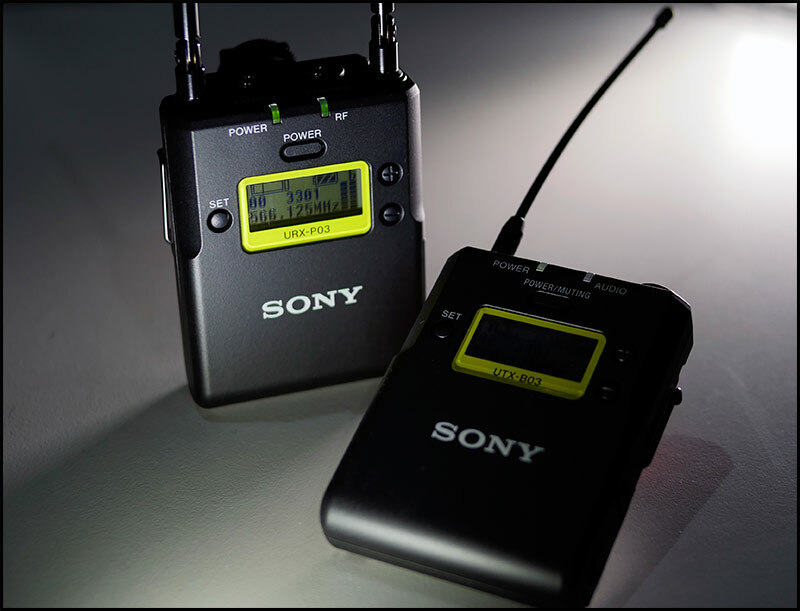 The radio mic was our new Sony UWD-P11 hybrid digital radio mic, this was a good test and it was as clean as a whistle. The 2nd main camera (GH4) had a 50mm f1.4 Leica lens set to f4 while the reverse shot (GH3) had a 35-100mm f2.8 lens. 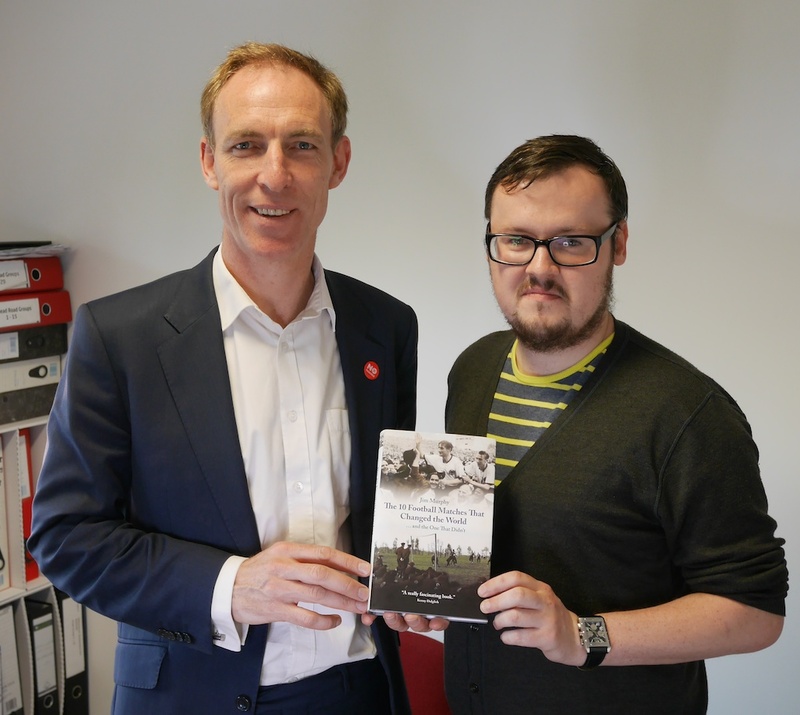 Jim and my son Scott who produced this and also interviewed Jim about the book and various football related topics.